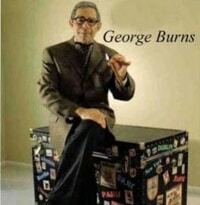 George Burns Lookalike Impersonator. He is an actor, comedian, impressionist and song writer and the most requested George Burns lookalike impersonator in the nation. While attending Monmouth College in New Jersey where he majored in Drama, he wrote, directed and acted in many original one-act plays. He was also an active member of several repertory companies where he performed in productions such as Cyrano, Pillow Talk, The Apollo Of Bellac, and Oh, What A Lovely War.Realizing that he had the ability to do stand-up comedy, he worked his way into the New York City clubs, The Improvisation, Catch A Rising Star, and the Comic Strip where he performed for almost two years before migrating to Mitzi Shore’s famous Los Angeles Comedy Store.He was selected by Mitzi Shore to represent the Comedy Store on a nationwide tour where he performed in colleges and universities across the country to standing room only crowds. 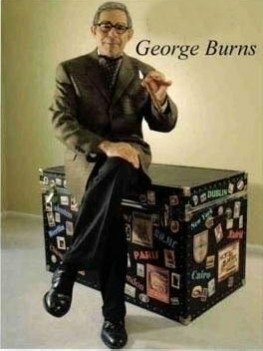 He is the most requested George Burns lookalike impersonator in the nation.He has appeared in several films and countless television shows, such as Evening At The Improv, Showtime and HBO. He has even co-hosted America’s Funniest Home Videos with Bob Saget and has gone on to win an Emmy award for his acting and impressions.Most recently, he has co-starred with Louise DuArt on a cable tv show called Café DuArt and has even done some writing for The Late Show starring David Letterman. In his comedy act, he blends in many of his over 130 impressions and his original songs with his hilarious stand-He has performed his act at comedy clubs all over the country, as well as Las Vegas, Lake Tahoe, Reno, and Atlantic City where he has starred in shows with Merv Griffin and Louise DuArt. He has even had the honor of having performed in Carnegie Hall. When he’s not doing his act at comedy clubs or corporate dates, He usually takes to the high seas on many famous cruise lines where he has the audiences falling overboard with laughter.